Save at least 5% by choosing our new 80lb Paper! Newsletters, despite their prosaic nature, are a tried and tested marketing tool you can use to connect with your customers as well as develop good relations with the same. These can be distributed in-house or just within a certain group such as a customer base. You can use the prints to provide information on upcoming developments, events, and subject matter that might interest your target audience. You can also use them to promote your products and services as part of your wider business strategy. Designing your company newsletters might take a lot of time and effort depending on the number of pages you’ll produce. Good thing there are a number newsletter ideas and templates that supply you with most common newsletter format to help you get started. You can just throw in your text content and images to achieve that professional look for your business newsletters! UPrinting offers a variety of custom and printing options for your newsletters from page size, binding, and cover paper. Our newsletters come in three standard sizes, with options to have either card or paper cover pages and matte or glossy inside pages. Our printing turnaround options are 6 business days on standard schedule and 4 business days on rush. Need some help setting up your newsletters' pages before sending them in for proofing? Just download some of our free newsletter templates to overlay on your design to make sure no important elements in your design are out of line. 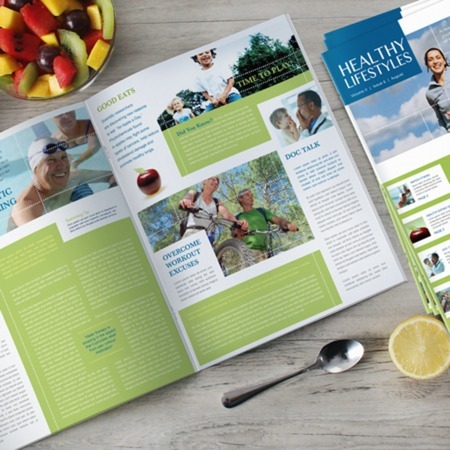 With our newsletter printing, you can opt to order newsletters in small quantities or print in bulk, have them saddle-stitched or wire-o bound, or go for as much as 40 up to 96 pages!